Hot off the press from Namibia. Here is the perfect luxury Namibia road trip itinerary. After countless weeks of researching, I was able to map out the perfect luxury Namibia road trip itinerary. I started by making a list of the things I wanted to see the most. First, I knew I wanted to see the towering red sand dunes of Sossusvlei. Second, I wanted to experience Namibia’s most unique and luxurious hotel properties. Then, I wanted to see the extraordinary place where the dunes meet the sea. Finally, I wanted to witness Namibia’s marvelous desert adapted wildlife. 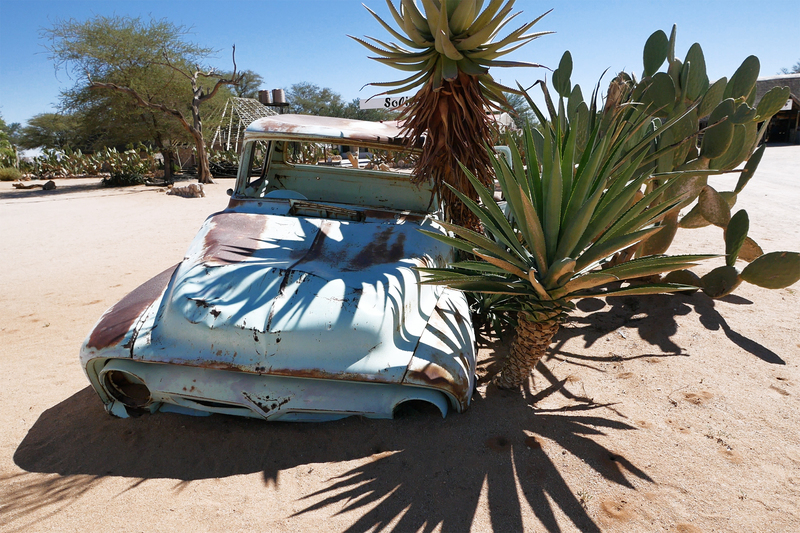 If you properly plan and prepare, a self drive tour of Namibia is perfectly safe. Most of the roads in Namibia are not paved. They are full of rocks, dirt, and gravel. Therefore, I recommend renting an SUV and learning how to change a flat tire before you set out on your trip. Also, be sure your car rental has a spare tire because we saw multiple cars with flats on the side of the road. Additionally, cell service areas and gas stations are scarce. As a result, you should map out directions and gas stations before you depart on your journey. My last tip is to stock up on plenty of water and snacks because you won’t find many places to stop along the drive. To start off my trip, I flew into Namibia’s Walvis Bay Airport. I chose to fly into Walvis Bay over Windhoek because of its location on the coast – where the dunes meet the sea. In addition, Walvis Bay Airport is small, clean, and convenient. Also, the Hertz Car Rental office is next door, making things easy. This is where I met up with my friend Kiersten, AKA The Blonde Abroad. 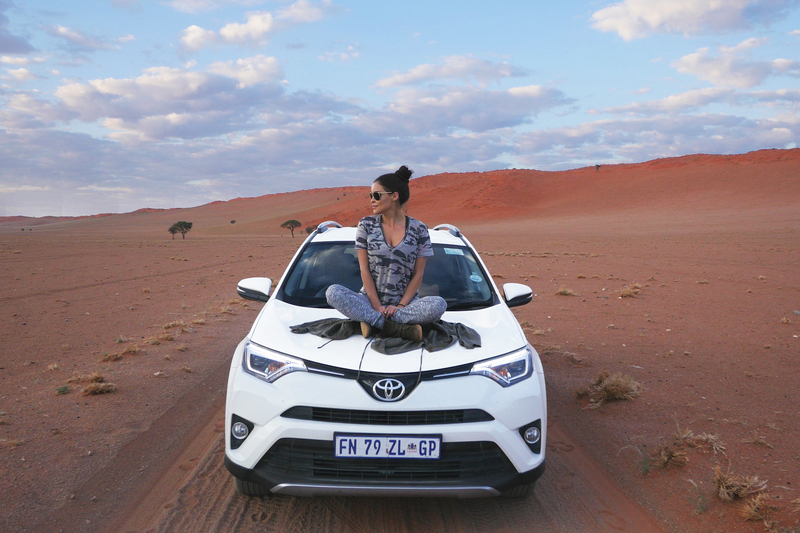 We picked up our SUV rental with Hertz and then took to the roads to begin our luxury Namibian road trip itinerary. In Namibia they drive on the left, which I found to be very easy since it’s so unpopulated. Walvis Bay was our first stop, where we did a little sight seeing. Walvis Bay is a cute coastal town with some good restaurants, nice beaches, abundant birdlife (lots of flamingos!) and sand dunes. This marks the start of the Namib Desert. We had a 4.5 hour drive from Walvis Bay to our second stop: Little Kulala Desert Lodge. The tiny and quirky town of Solitaire is about halfway between the two. This is a great place to stop to get gas, enjoy a slice of apple crumble, and check out the old abandoned vintage cars. Once we made it to Little Kulala, we were pleased to find that we had our own thatched-roof desert villa. Stone and wood were used throughout the decor to create a wonderful natural ambiance. The private plunge pool, expansive deck, and rooftop star bed made it a most noteworthy experience. Most of all, I loved the desert views which were incredible. Watch my video and read more about this lodge here. 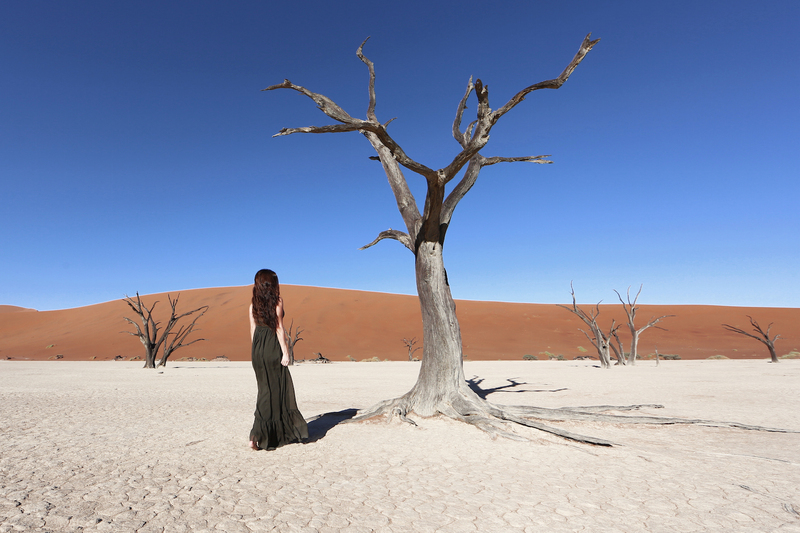 From Little Kulala, we did a quick day trip to Sossusvlei and Dead Vlei. Every Namibia road trip itinerary should include this one stop. It is truly a unique place. Sossusvlei is a giant, flat, clay plan surrounded by large red dunes. It is characterized by its lifeless branchy trees and salty white ground. The 5 million year old Dune 45 is the most popular to climb and photograph. After Little Kulala we were back on the scenic rocky roads for 1.5 hours to the Wolwedans Dunes Lodge. From someone who stays in luxury hotels for a living, I can easily state that this property is one of my top 3 favorites in the entire world. It is positioned on the top of a massive dune in the NamibRand Nature Reserve. The desert views are absolutely breathtaking. It is romantic, remote, and wild. A truly unique experience. 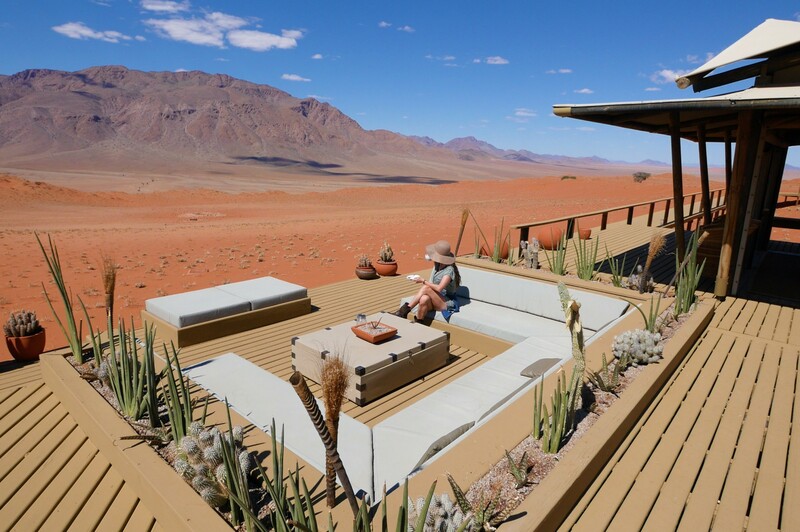 Wolwedans Dunes Lodge offers private safaris where you can spot giraffes, zebras, oryx, cheetah, and more. Nighttime at Wolwedans brings a magical candlelit experience with fire pits and a sky of massive stars. The accommodations are luxury chalets that open up to the outdoors like a tent. 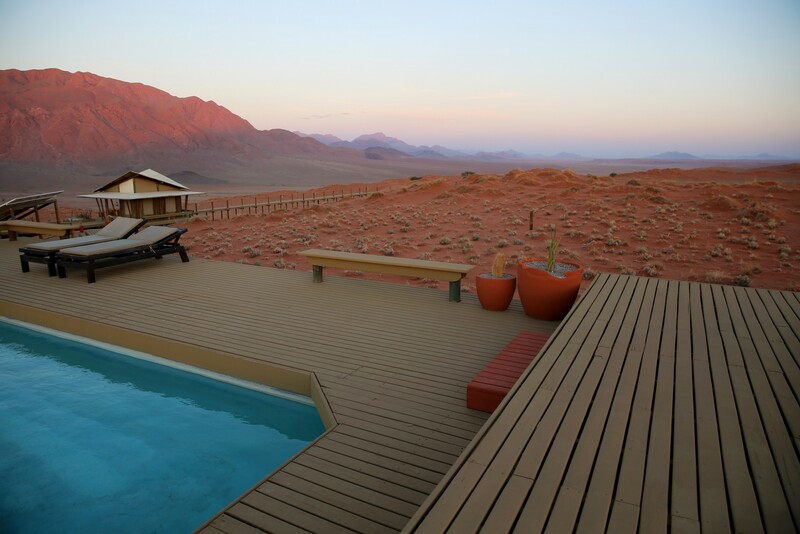 To see more on Wolwedans Dunes Lodge keep an eye out for my upcoming post and video. 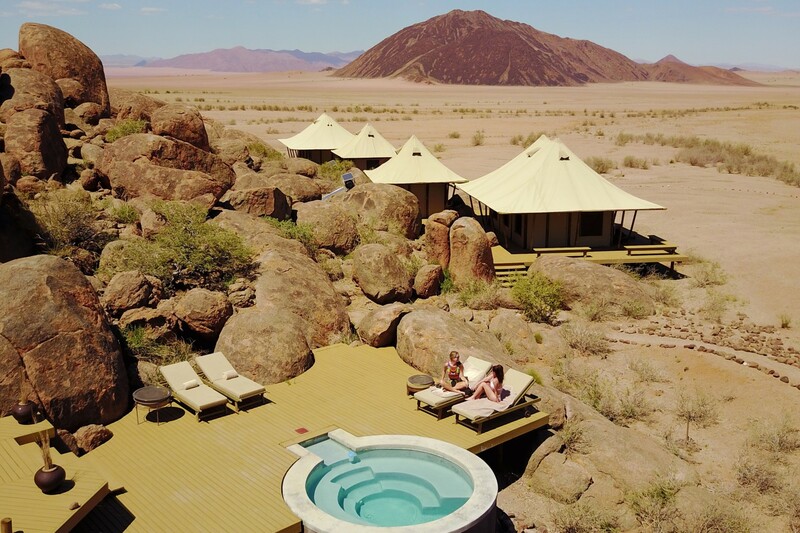 Wolwedans Boulders Camp was the last stop on my luxury Namibia road trip itinerary. This camp was something out of a dream. It is very exclusive as it only has 4 luxury guest tents. This creates the perfect intimate nature experience. Gigantic boulders and exotic wildlife surround the camp. I remember sitting in the plunge pool, sipping on my rock shandy, and watching zebras graze by. Now that was something special! Stay tuned for my upcoming video of the majestic Boulders Camp. On your departure, consider flying out of Windhoek Airport. This will allow you to take a different route back, with a stop in Namibia’s largest city. In conclusion, this itinerary was the perfect mix of sightseeing, adventure, and desert tranquility. I found the amount of time on the road to be the perfect amount. It allowed us to see multiple different types of scenery without spending our entire holiday in the car. 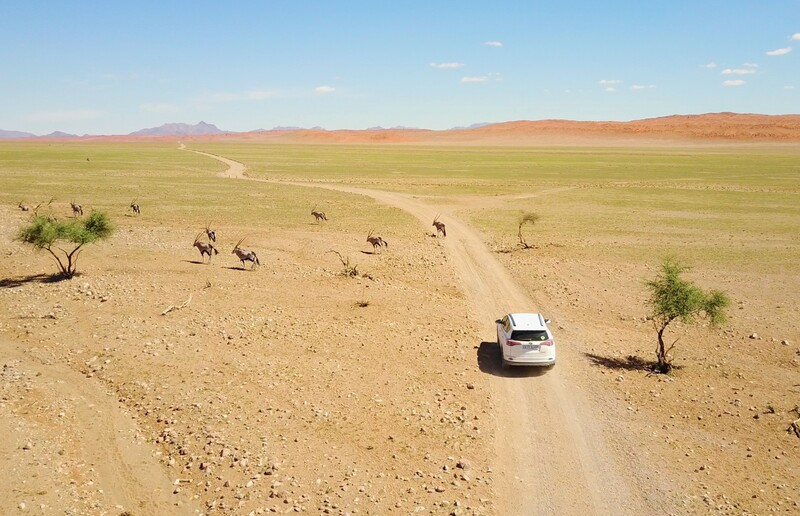 I was hosted as a guest of Hertz, Roar Africa, and Wolwedans, but the opinions expressed in this article are entirely my own.